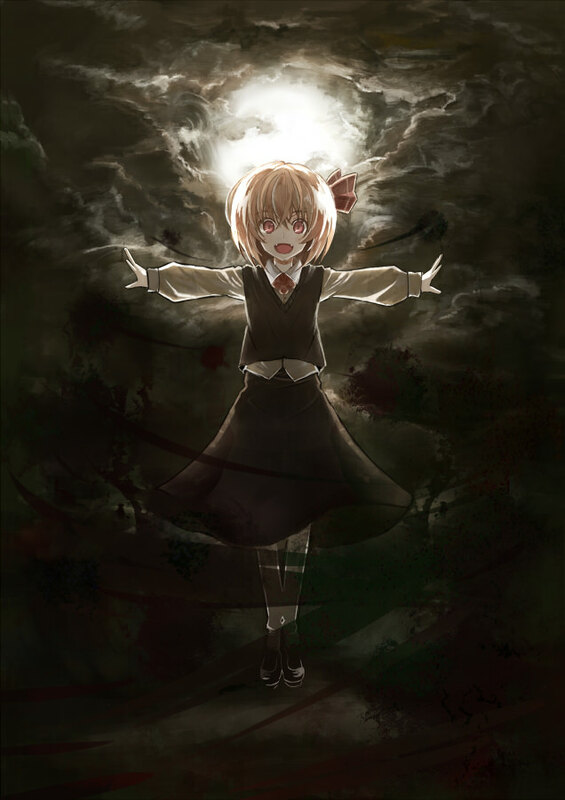 > Recently, an incident overcame Gensokyo where hostile; phantom figures would appear, attacking people without regard for the Spellcard rules. Shortly after finding out about the incident, you stumbled upon a strange being from a world called Makai called Louise, as well as encountering and befriending the Karakasa; Kogasa. > After this; Louise used the vantage point of Youkai Mountain to identify two locations she wanted to investigate. On the way to the first, you were attacked by a group of Makai Fairies; led by what is best described as a Makai Sunflower Fairy; Donitia. She claims to be the strongest fairy in Makai, but currently is out of energy due to her being outside of Makai. > You were then attacked by the one who sent out Donitia, Mayina. A male, orange-haired daemon [wearing an outfit similar to Koakuma] who attempted to kill you and your friends. However, his last-ditch magical explosion failed; and he has also exausted his magical reserve and is current your effective prisoner. After all, he can't be allowed to return to Makai and inform his boss, it could make the incident even worse, according to Louise. > When you reached the Forest of Magic, you were attacked by dolls, includeing a giant one. Kogasa managed to find the one controlling the dolls; and between your talking and Kogasa's actions, she let you go. It seemed that the Makai residents knew the puppeteer however, and she did not want them to know about her. > Finally you headed to the Hakurei Cave. After making a stop at an invisible Hakurei Shrine to enlist the help of Sunny's group, you managed to convince Aunn to leave her guard of the cave. > Currently, you are halfway through breaking through a seal in the cave. However, this triggered some sort of trap utilizing Hakurei Ying-Yang orbs; which Louise has stopped. You are now attempting to get past the seal's second layer, and some strange fragments floating there crackling with ominous energy. > Your current party is yourself; Wriggle; Mystia; Cirno; Daiyousei; Louise; Kogasa; Donitia; Mayina and Clownpiece. > The bullet brightens up as the fragments break it apart and absorb it. > The crackleing is getting more intense, and audible. After absorbing the dark bullet, you feel something... ominous. The cave feels colder... no that one's just Cirno Perfect Freezeing the slow-area and the orbs. > "These fragments seem to charge with shots, let's take cover and set them off from a distance"
> Who else can create darkness bullets? > There are no clear patterns. > "Cover?" Mystia asks. "There isn't really any except that big ice block, and we can't all fit behind it." > "And using that as cover might not be the best idea..." Daiyousei adds. > No-one, at least that you know, can form blasts out of darkness. Darkness youkai and all. > You personally move to a position near the ice block; and fire a stream of bullets towards the barrier and the fragments. > You stop; not because it looks like they'll explode, but because they start moving. Pulling themselves towards each other.Small splinters of wood connecting into larger ones. > What seems to be forming out of the fragments? > Are the pieces still moving even though we stopped shooting? > Clarification: Barrier around individual clumps or the entire group of fragments? > You form a barrier around one of the clusters of fragments. > This seems to disrupt the energy enough that the fragments in the cluster fall to the bottom of the barrier, although they do not separate and continue to join together inside it. > How many clumps are there? > You attempt to do this, but the energy resists, acting like some sort of net around your barrier after you move it more than a few centimeters. > Currently 8, five wooden, three metallic. The metal ones are joining together into some sort of large crescent, while the wood ones are joining into a staff-like shaft. > "If that is what I think it is... we might be in trouble." Louise says. > "What are the fragments forming? I'm able to disrupt their energy with my barriers"
> "A Sceptre." Louise says. "But I do not see it's owner anywhere." > As you try to form a barrier around the crescent, the dark energy around it lashes out and breaks it. It seems the energy is stronger there. > The energy web will not let you move the wood that far. > "Who is it's owner?" > "I don't know her name... but she's a wicked spirit who entered Makai alongside a terrifying Youkai, a witch and Reimu." Louise says. > You form a second barrier. It works; but it dosen't feel like you can hold two of the barriers up against the energy. > As the scepter re-forms more, you feel a presence. You think you see a hand reach out for the still-forming magical focus for a moment. > "Reimu has been to Makai before?" >"Perhaps we can negotiate with them?" > "Yes." Louise states simply. > You form a new barrier over where the phantom hand showed up for a moment. The barrier fails to form. > You form a second barrier around the first one instead, reinforcing it. > The fragments form into an almost complete staff, the missing piece clearly being what you've put a barrier around. > "I doubt it." Louise replies. "But maybe she's more amicable to Youkai." > The hand re-appears, more visible than before. Dark energy crackles from the fingers and shatters the barriers you put up; and the staff forms whole. You hear a very faint and chilling "Don't get in my way." > The phantom hand reaches for the now-complete stave. >"Everyone hold your fire, but stay on your guard. We don't know yet if this spirit is a friend or foe." > No-one shoots at the spirit. The hand grabs the stave. > At that moment, there is a wave of... cold. The type that sends chills up your spine. The phantom hand solidifies and more forms behind it, as the stave is raised. As this is occurring, you feel a completely overwhelming magical presence. 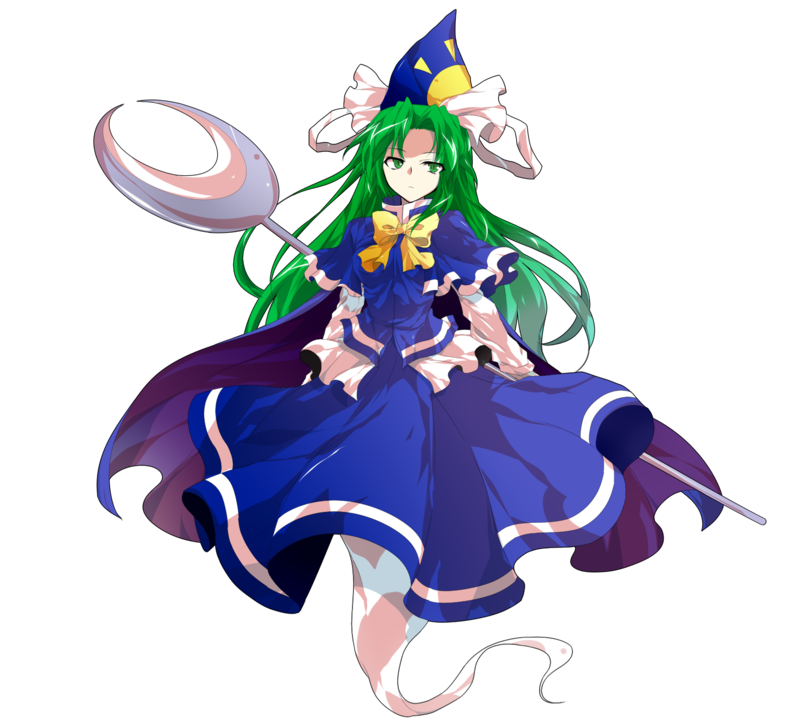 > An Evil Spirit emerges, with vivid green hair, and wearing a striking blue outfit [Which oddly has a long skirt despite her lack of legs]. She is wearing a conic hat with a yellow sun upon it. > For a moment, black energy arcs around her, striking all the talismans and the barrier; which cracks, but stays intact. The talismans burst into black flames and burn. > The phantom then falls to... what you guess is the equivalent of her knees, panting heavily, before she looks up, hate in her eyes and says one word. >"We're not affiliated with that shrine, so don't worry..."
> The spirit dosen't respond to your statement about the shrine. > "Better than I have been for over a decade... where is Hakurei..." the spirit says. She spits that name like it's a curse. > "Hakurei who? The barrier?" > "What happened to you? You're fragments seem to have been caught between the seals we were destroying"
>We already mentioned the shrine, and this lady doesn't look stupid. Plus she's powerful. It'll be wiser to not do something like this. >"No idea. There's an incident going on, so she's off who knows where." >"She's probably going to tear all of us a new one if she finds out we came here... So you've been trapped in there for over a decade? Yikes, that must've felt horrible." > The spirit looks at you for a few seconds. > "Yes, I guess that makes sense, else you wouldn't have even made it to this cave. And that means there must be an incident. Especially with these Makaians here." the spirit muses, getting up. "They found a way back without breaking the barrier. And there's some youkai here trying to break through. How... amusing." > "Your fate isn't of any concern to me... but yes; I was sealed in a seal within a seal; my energy siphoned off to strengthen the barrier between worlds. A true hell beyond Hell. Have you ever felt the pain of the Hakurei exorcism? Try facing it's full wrath for over a decade, unable to move to the point you cannot even scream." > The spirit thinks for a moment. > "If the Maiden is solving an incident, I shall await her at the site of her Shrine then." > "That might not be such a good idea considering she had over 10 years to get more powerful while you were stuck between worlds. I assume she sealed you in the first place." > "The Makai people might not be breaking this barrier to get to Gensokyo but have found a way to break the Hakurei barrier which sustains our world, and we are trying to figure out how and why. We were trying to get in to Makai when we freed you"
>"Besides... Things might have changed a lot since you were sealed. ...Are you aware of the spellcard laws, Miss... um..."
> The spirit scoffs at you pointing out Reimu got stronger. > "Interesting..." the spirit remarks; before she slings her stave over her shoulder and fires a thin beam of light from it, tiny twinkling lights streaming off it like dust. > The beam pierces the already damaged barrier, which shatters. > "Do as you please. That's the best way to live after all." the spirit remarks, floating aside and out of the way of the now-opened tunnel. "Although I doubt a child like you could survive in that world." > "Rules? Bah, the youkai actually accepted those things she was drafting up? Where's the fun in that?" the spirit remarks, sounding almost insulted. She seems to ignore your inquiry into her name.